The Staff were very friendly, room were clean, the coast was out the back patio. I love the ocean view but unfornately, it was raining and super windy doing my stay that I didn’t get to enjoy the balcony. Staff was always so friendly and helpful. Location was perfect. Got dog-friendly rooms with sliders to elimination area for dogs. The room was extra roomy. The bed was comfortable. The refrigerator was full sized. The staff upgraded us to a bigger suite. It is an older facility nothing to write home about. This hotel is situated just north of the Crescent City harbor and offers easy access to Crescent Beach and the Redwoods National Park. There are several decent restaurants in close proximity to the hotel. If you get the chance, be sure to visit the Dutch Bros. Coffee shack a few minutes north of the hotel. Breakfast was nice, the location was easy to get to, and the beds were comfortable. Saroj was instrumental in helping me get a room as booking.com did not report my online reservation. 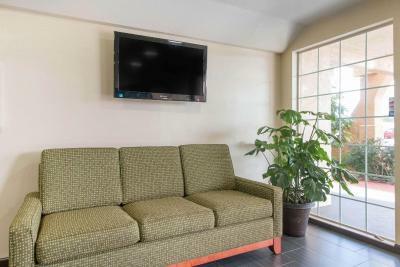 Quality Inn & Suites Redwood Coast This rating is a reflection of how the property compares to the industry standard when it comes to price, facilities and services available. It's based on a self-evaluation by the property. Use this rating to help choose your stay! The Quality Inn & Suites Redwood Coast is off of Highway 101, just 3 miles from the Redwood National and State Parks headquarters. 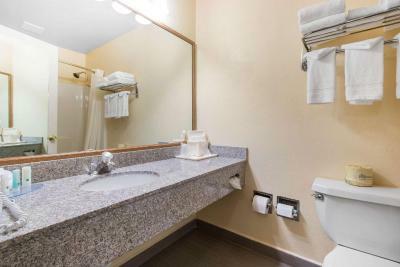 This Crescent City, CA hotel is near area attractions like the Elk Valley Casino, Jedediah Smith Redwoods State Park, Ocean World and St. George Reef Lighthouse. Several stores and a variety of restaurants are within walking distance. The beach and harbor are within 500 feet of the hotel. This quaint town is nestled along the northern coast of California with many outdoor recreational activities nearby like fishing, hunting, rafting, kayaking, surfing, boating, biking, windsurfing, bird-watching, whale-watching, hiking and swimming. Additional local attractions include Battery Point Lighthouse, Crescent City Harbor and Lake Earl State Park. Guests at this Crescent City, CA hotel can enjoy many amenities and features like free deluxe continental breakfast, free local calls and free coffee in the lobby. Business travelers can appreciate conveniences like free high-speed Internet access in all rooms and access to copy services and business center. All spacious guest rooms include coffee makers, refrigerators, microwaves, ironing facilities, hairdryers and cable TV with HBO. 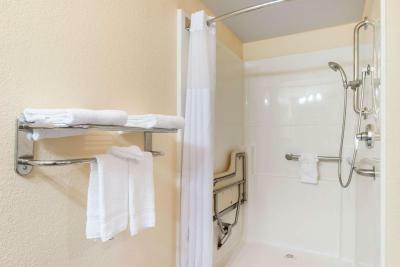 Many rooms and suites have balconies and large whirlpool tubs. Laundry facilities are on the property for guest convenience. 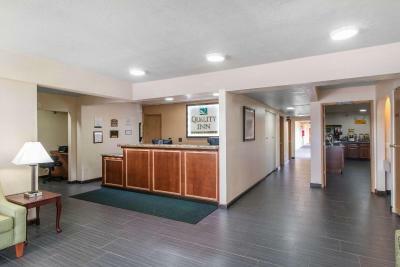 When would you like to stay at Quality Inn & Suites Redwood Coast? Free WiFi, a cable TV with premium channels, a coffeemaker, refrigerator and microwave are included in this room. Please note: No pets are allowed in this room type. This nonsmoking room features a balcony and a cable satellite TV. Free WiFi, a flat-screen cable satellite TV with premium channels, a coffeemaker, a refrigerator and a microwave are included in this air-conditioned, nonsmoking room. This family room has a tea/coffee maker, air conditioning and tumble dryer. House Rules Quality Inn & Suites Redwood Coast takes special requests – add in the next step! Quality Inn &amp; Suites Redwood Coast accepts these cards and reserves the right to temporarily hold an amount prior to arrival. Quality Inn & Suites Redwood Coast accepts these cards and reserves the right to temporarily hold an amount prior to arrival. We arrived with sleeping kids at 9:45. We carried the kids and put them straight to bed without turning on the lights. This was our first mistake. After hauling our stuff upstairs (no elevator) we noticed the smoke detector was dangling by its cord from the ceiling. The next morning we saw the sink had splatters of vomit, boogers smeared on the shower curtain, full and empty beer cans with other trash under the beds, many used q-tips in the room, greasy hand prints on the furnature, and stained sheets. THIS WAS DISGUSTING AND UNACCEPTABLE! Leaving was the best part of our stay. Place is in need of updates, however efforts seem to be made to keep the unit clean. surrounding property was not keep maintained, took away from the Hotel. The carpet needed to be clean often. It was dirty. Hot breakfast was marginal. Had Fox News on in breakfast area. One of the two rooms I booked smelled of urine. We had two dog friendly rooms: one smelled fresh and clean; the other room smelled like urine but was clean. We did not notify staff as we spent most time in one room. Room was not clean. There were bottle caps and garbage on the floor when we walked in. Someone had cut their hair in the bathroom and the hair was not vacuumed up. Walls and door are thin, so you can hear everything outside. There wasnt much that I didnt like! The entire facility was extremely clean, the front desk was very helpful, room was spacious and warm. We drove in from Olympia, WA yesterday 11 hrs non stop and it was so nice to check in and have a clean room. The office helped us find locat food which was very good! Will be staying here again!! There was a dog outside our window that woke us each morning at 7 am. Kitchen was very limited with cups and utensils. There really wasn't a view as advertised. Plus, both of our keys were canceled the first day when we were out and we had to go back to the office to get new keys. The bathroom exhaust fan was so loud and came on with the light that it made you want to go to the bathroom in the dark!